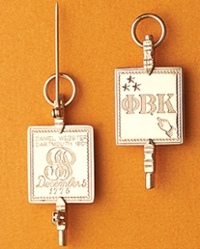 The Phi Beta Kappa key is a widely-recognized badge of academic honor. The present standard key, except for its smaller size and for the lower stem added by the branch at Yale, is substantially the same as the original medal of the Alpha of Virginia. On the obverse, the medal bears the Greek letters Phi Beta Kappa, the initials of the Greek words: Philosophia Biou Kubernetes, "Love of wisdom is the guide of life." In the upper left corner three stars symbolize the aims of the Society; Friendship, Morality, and Literature. A pointing hand in the lower corner symbolizes aspiration. On the reverse, the letters S P represent the second motto of the society, Societas Philosophiae. Below them is engraved the historic date, December 5, 1776. Above them the name of the member is often inscribed.